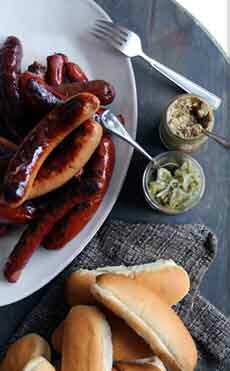  New England-style hot dog rolls have straight edges, which get crisp when toasted (photo courtesy King Arthur Flour). Woo hoo: Slotdogs (photo courtesy Gadgetify). Following up on yesterday’s homemade hamburger roll recipes, today we present the hog dog roll recipes from King Arthur Flour. Hot dog is an American term for what initially was called a frankfurter, a style of sausage favored in Frankfurt, Germany. It was brought to the U.S. by German immigrants in the 1880s. Here’s the history of hot dogs. 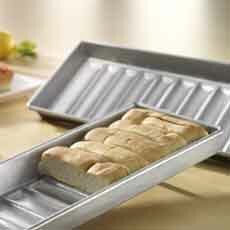 While any hot dog or hamburger dough recipe works in any hot dog pan, you do need special baking pans to shape the rolls. First decide if you want to make rolls with classic rounded edges (photo #1) or the straight-edge New England style (photo #2). We prefer the latter, because it’s also the classic lobster roll style (lobster rolls originated in New England); and perhaps more importantly, the straight edges get crisp when toasted. Next, decide on the size of the pan. We vote for the larger, 24-bun size. If you won’t use all of them, freeze the rest. This classic recipe can be used for hot dog or hamburger rolls. An egg wash places a shiny glaze on the rolls. While not exactly brioche, this recipe produces very buttery buns—also great for lobster rolls. 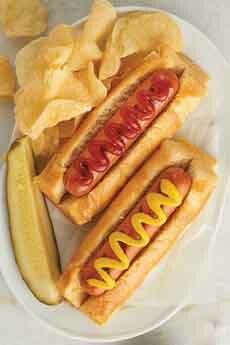 Speaking of which: here are 20 other uses for hot dog rolls. Don’t want the extra butter of recipe #2? Whether you want your rolls classic- or New England-style, try this recipe. It’s different from recipe #1, in that it adds potato flour and an egg to enrich the dough. Recipe #1 uses the egg in an egg wash, to glaze the rolls; and only all-purpose flour. 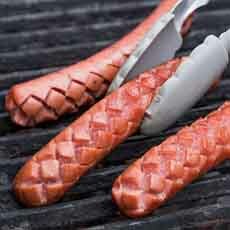 While looking at hot dog pans, we came across SlotDogs (photo #4), a device that makes criss-cross cuts in the dog before grilling. They’re easy to make with the special Slotdog cutter. Kids may think they look like dragon scales; we just enjoy the geometrics. In addition to looking way cool, the cuts allow the smoky grill flavor to penetrate more deeply, and enables the juices to caramelize the edges. Plus, as with penne rigate and other pasta shapes with ridges, the toppings cling better, too. We use the word roll instead of bun to denote hot dog-specific bread. There is no official difference: Both are single-serve breads, and the FDA only stipulates that buns and rolls weigh less than one-half pound (as opposed to loaves of bread, which must weigh one pound or more). Rolls is the term generally used for individual breads that hold a filling—either pre-filled like cinnamon rolls or sandwich bread like Kaiser rolls. The notable exception is hot cross buns, which are filled with currants or raisins and thus should be hot cross rolls. However, the first recorded use of the term “hot cross bun” appears in 1733, when there was no distinction. Buns typically do not contain a filling, but can be eaten plain, with a spread (butter, jam), or used as a sop, i.e., to wipe up a liquid food: gravy, sauce, soup, stews. Bunne was the word used in Middle English. The use of roll to describe a small bread came much later. The oldest reference we could find is to Parker House rolls, in 1873. Biscuits use a different leavening. Biscuits use baking powder to rise; buns and rolls use yeast. Texture: Rolls can be hard (crusty) or soft, buns are soft, and biscuits are pillowy soft (from the baking powder).